cups, saucers, plates and bowls. 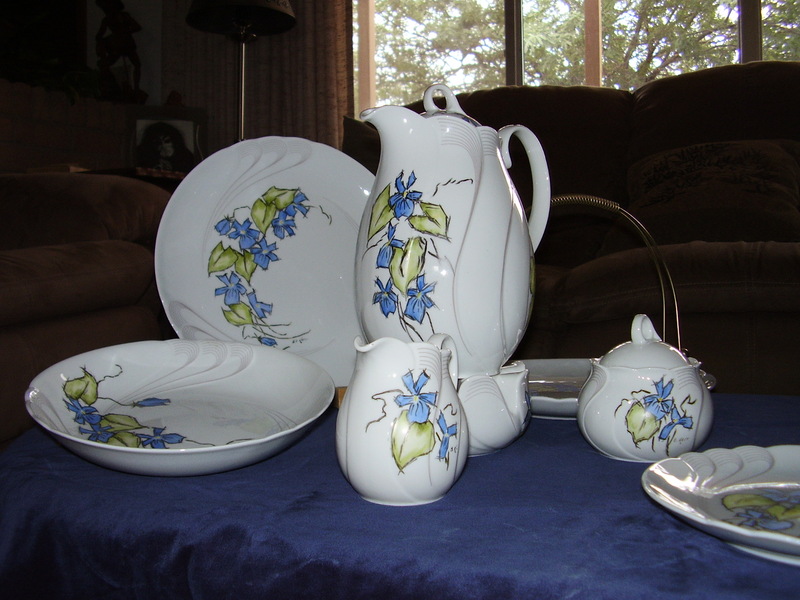 a creamer, sugar bowl, and cake plate. A signature design favoured by my father. two cups that had been positioned close by. Fine porcelain reduced to shards. Doesn’t happen often, but its part of the game. In 99 words (no more, no less) write a story about shards. You can write about the pieces, the item they once were, or who picks them up and why. Go where the prompt leads. Your papa made some pretty purty things. I’ve never done any pottery/kiln work, but my younger brother did in high school. His stuff wasn’t nearly as beautiful as those pictured here, but I still feel a pretty tight sentimental connection to the pieces. I’d feel terrible if I broke them after they came out of the kiln nice! I enjoyed making some pottery in High School. Though only the teacher had access to the Kiln. I’ve worked with polymer clay. But that only needs to set in a home oven at 250 degrees for about 15, 20 minutes. Not as sturdy as real clay, but you can make some nice things with it. I have a couple of kilns and although my wife is a potter I’m really not. The clay she uses typically bisque fires at about 1900 degrees F. Glaze firings vary but typically run around 2200 degrees. I do some china and tile painting for that there are usually multiple firings – all at around 1400 degrees. An air bubble in the clay can expand at those temps and take a piece out. Can even damage some of the pieces nearby in the kiln. I’d like to see some photos of what the polymer clay comes out like? Do you have pictures you can share? I sent an email. Though, none of my polymer this time. Cheers. I have been fortunate enough to have been the recipient of some of Jules’ polymer clay. She sent my husband and me a housewarming gift of a wheel barrel full of veggies rendered exquisitely with a candle. Nice, and I am sure you have displayed it proudly. It’s a wonderful workplace meets artistry kind of story, and then that last line — pure philosophy. Good one, TN! And I love the photo of the ceramics, too.